Wise, witty, and exquisitely directed by Davis McCallum, this lost Ferenc Molnár masterpiece is the currently the best revival in town. The Mint Theater Company continues its rediscovery of great forgotten masterpieces from the world repertory with a marvelously witty and wise Ferenc Molnár comedy-drama not seen in New York since 1922. What will surprise you most about this shrewd and cunning comedy of character is not how old it is (it could have been written yesterday) but that this play has been missing from our stages all these years. Could it have been the need for a new translation or the large cast of 20 characters or the requirements of a completely stocked haberdashery? In the hands of the astute and deft Davis McCallum, this is an elegant and exquisite revival of a play that should be better known using a magnificent cast of 14. It has all the polish of a European production from a centuries’ old national theater company but played entirely by Americans not trying to sound Hungarian. Fashions for Men by Ferenc who you may ask? Ferenc Molnár is to Hungary what Pirandello is to Italy, Schnitzler is to Austria, Brecht is to Germany, and Strindberg is to Sweden. If you have seen Rodgers and Hammerstein’s Carousel, you have seen the plot lifted from his play Liliom, also famous for a Charles Boyer movie directed by Fritz Lang. In the 1930’s alone, Hollywood adapted eight of his plays and novels for successful films. And, of course, his masterpiece was The Play’s The Thing, produced five times on Broadway (last by the Roundabout in 1995) and at least two times Off Broadway including at the Storm Theatre in 2013. You are in excellent hands with a play by Molnár, that worldly wise European sophisticate. Although the play is set in another time and another place, Molnár is so keen an observer that he puts the entire milieu of his society on stage without the slightest didacticism, as he is too wise and witty. The English language title, Fashions for Men, is a bit of a misnomer, both as the Budapest haberdashery depicted in Act I and III sells high end clothing for both men and women and the hero-protagonist is contrasted with several other very different male leads in the play to whom the women in his life are attracted. Peter Judász with his wife Adele is the proprietor of one of the city’s most fashionable and exclusive shops. What is not immediately obvious from the number of customers in the shop is that Peter is bankrupt – his saintly nature does not allow him to say no to anyone, to always give the benefit of the doubt and to offer credit and loans that won’t be repaid. He has even lost his wife Adele to Oscar, his top salesman, an ingratiating snake in the grass, who seems to be Peter’s exact opposite. And to top it off, Adele has given Oscar her husband’s life savings in order to start his own business elsewhere. But Peter has friends in high places. Just in the nick of time, the Count who has made his success by sending his friends Peter’s way offers to give him a job managing his country estate and farms. Along with Peter comes the beautiful young Paula who is attracted to the Count and insists on trying her luck with a job at his estate. However, the leopard does not change its spots, and after four months Peter is in hot water there too. His tender heart is bankrupting the Count who also finds him in the way of his pursuit of the young and seemingly naïve Paula. The only way to get rid of Peter is to pay his debts and ship him back to Budapest. But will this work? Will he take the bait and leave, and will he leave Paula, with whom he has fallen in love, in the Count’s clutches? Never fear, Paula can take care of herself and this being a comedy all will work out in the end – after a number of other unforeseen twists and turns. Is Peter a holy fool and a first class idiot? Or so psychologically needy that he seeks affirmation from everyone he knows? 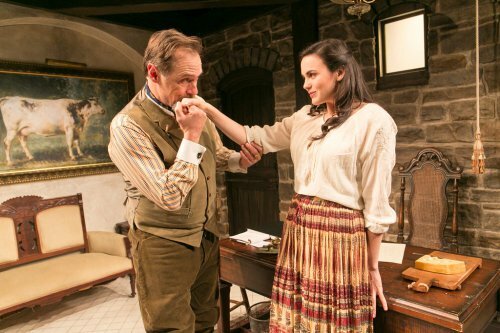 In any case, Molnár not only puts all of society on stage in the course of his story, but he also makes us aware of the mores and manners of an entire culture in the course of the play’s delightful three acts. The fashion in men extend to the devious Oscar, the saintly Peter, lascivious Count, and Philip, Peter’s elderly salesman, a wry observer of life as it is lived. Paula and Adele could not be more opposite. And the many types of customers people an entire society. Molnár is an astute social psychologist and he needs only a few lines to sketch in a completely recognizable three-dimensional personality. 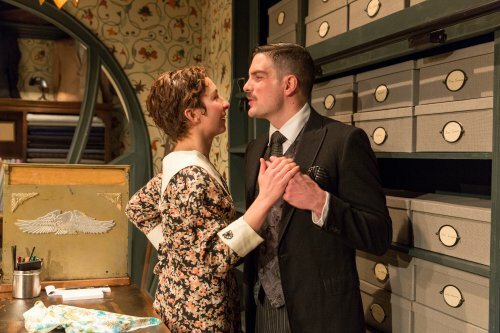 A great deal of the success of the play goes to Daniel Zimmerman’s two realistic sets – the completely appointed Art Nouveau haberdashery and the stone office on the Count’s estate. Not only do they put a piece of Hungary, circa 1917, on the stage of the Mint but they are theatrical in themselves. Joshua Yocom is responsible for the props which make up the stock of the shop. Martha Hally’s costumes and Robert–Charles Vallance’s wigs and hair also add greatly to the look of the play. The music by Jane Shaw and the lighting by Eric Southern add to the elegant and sophisticated milieu. McCallum’s direction peoples the stage with all the types in society. The play could rise and fall on the casting of Peter Juhász who is the center of the entire action. While Joe Delafield makes you want to strangle him at times he is entirely believable as a man who can never put his own interests first. On one side of him is Kurt Rhoads as the elegant continental Count, a performance worthy of Maurice Chevalier or Louis Jourdan. On the other side is the hypochondriac Oscar played by John Tufts who is able to play on women’s sympathies. Michael Shantz is very amusing as Mate, a lazy con-artist adept at twisting people around his finger with his lies. Jeremy Lawrence, a veteran of the Mint’s productions of Lennox Robinson’s Is Life Worth Living?, Maurine Dallas Watkins’ So Help Me God and Arnold Bennett’s What the People Want, brings his subtle technique to bear on Philip, Peter’s most loyal salesman who says most by saying little. Annie Purcell makes us understand the unfaithful Adele who has had enough of Peter’s passivity to the point of needing to throw him over. On the other hand, Rachel Napoleon makes the young and sly Paula a fascinating character to watch as she plays her cards close to the vest, revealing little and playing a merry game with men who are elderly and seemingly more experienced than she. Mark Bedard, Purcell, Schantz, Maren Searle, John Seidman, Jill Tanner and Gabra Zackman beautifully play a panoply of customers from various walks of life, often returning as additional types, adding to the author’s droll sense of humor. Particularly excellent is Tanner’s Aristocratic Lady who knows how to make an exit in each of her appearances. Though totally unknown to Americans, Ferenc Molnár’s Fashions for Men is another treasure newly unearthed by the reliable Mint Theater. 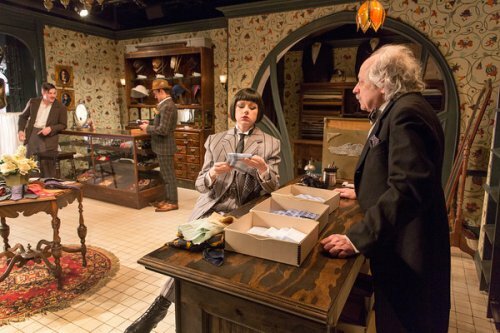 Davis McCallum’s polished and period-perfect production is not only vastly entertaining and enlightening about the human condition, but it should go a long way to making this play more widely known to the theater-going public. While the play is set in a world that is long gone, its contemporary relevance is based on the fact that it dramatizes the human comedy which will always be in fashion. In his latest work, Craig Lucas brings the pain and the tedium to a modern version of the Book of Job. Mint Theater offers elegant world premiere of Miles Malleson’s 1933 dramedy on open marriage and its consequences staged by artistic director Jonathan Bank. Theatre for a New Audience offers the first revival of Ionesco's play in Darko Tresnjak's production of a new Michael Feingold translation. Michael Weller has reduced Molnár’s Hungarian masterpiece “Liliom” from 33 characters to nine and Americanized the play by resetting it in 1932 Coney Island. Matthew Broderick is fascinating as an Irish widower in therapy who is haunted by his wife’s ghost in this excellent revival of the psychological drama.